The idea of MediaWikiLite is to allow the current MediaWiki codebase to run as a standalone server without requiring a database server or web-server so that it can be used like a wiki on a stick. This forms the foundation for a number of alternative uses for the MediaWiki software in environments where the current LAMP architecture is too resource intensive. There are a number of personal desktop wiki's out there, but they do not use the MediaWiki parser, and making a fork of the parser code defeats the purpose. Also, embedded devices such as PDA's, iPod's and iPhone's can only run lite applications effectively and getting MediaWiki onto them would be very useful, especially if it could synchronise with a web-based mirror when an internet connection becomes available. A lite version of MediaWiki would make a possible candidate for a client side wiki interface to a P2P article space, i.e. a decentralised Wikipedia or PeerPedia. As of version 1.13, MediaWiki natively supports the SQLite database which is a program library compiled in to PHP instead of running as a separate server outside of the PHP environment. A running instance of MediaWiki 1.15.1 using the SQLite database can be seen at mediawikilite.org to test the current functionality. To remove the need of an external web-server such as Apache or IIS, we're using NanoWeb which is a web-server entirely written entirely in PHP and comes with a number of modules such as a mod-rewrite clone for friendly URL's. It can execute CGI scripts using a normal CGI module or a FastCGI module. I've packaged PHP/SQLite, NanoWeb and MediaWiki together into a self-contained folder structure which can be downloaded from here for testing purposes. The wiki is started by running the wiki.bat file in the base of this structure. Currently it only runs in Win32 environments, but soon the one structure will be able to be moved between Linux, OS X and Windows. The sysop user is WikiSysop with password admin. The database is in a file called wikidb.sqlite in the wikis images directory to be sure it's a writeable location and that it's bundled in with the uploaded file content of the wiki. The php directory is a standard PHP installation except for some changes in the extension section. The nanoweb directory is the current NanoWeb condebase with no changes. The mediawiki directory is a standard current MediaWiki code-base, except for LocalSettings.php and extensions. The sys directory contains various scripts required during wiki startup. The wikidb.sqlite file is the entire wiki database containing all the articles and history (not the images though). Use the wiki.bat file to start the wiki, soon this will work across platforms, but currently only works on Win32. LoadLimitErrorMessage = Server load is too high (<b>%CUR_LOAD/%MAX_LOAD</b>), try again in a few moments. The wiki.bat script then calls a second script called make-conf.bat which creates a nanoweb.conf file in the systems %TMP% directory. This step needs to be done because the NanoWeb configuration requires absolute file locations, the script is able to use a file-template based on the configuration shown above and replace all the file paths with the %CD%. Wiki.bat then starts up a browser loaded with an HTML page called splash.html which is designed to redirect to the wiki main page after a few seconds to give NanoWeb a chance to start up. Launching NanoWeb is the last thing the wiki.bat script does and this command doesn't return until the command window is closed which shuts the web server down. 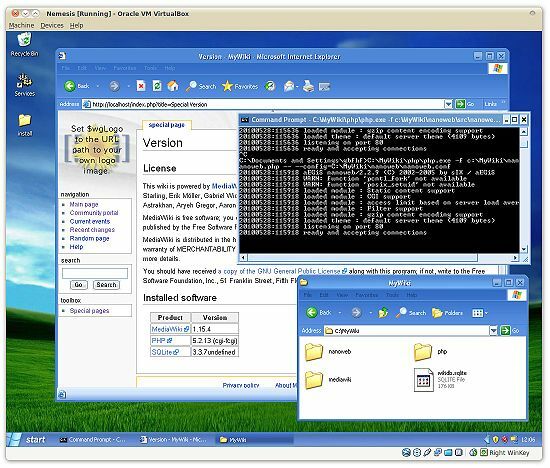 Here's a screenshot of the portable structure running in a virtual box installed with Windows XP (that I'm allowed to use due to the COA sticker on my computer). Currently we don't have a self-contained folder structure that MediaWikiLite's can run out of, so you'll need to ensure that SQLite is installed into the PHP environment properly. It's important to use SQLite3 rather than 2 because the former supports more similar syntax for some SQL such as table creation. Aside from that, version 3 uses more compact files and executes more efficiently because it works via PHP's PDO functions. Check your phpinfo() to see if pdo_sqlite is listed, if not, try adding extension=php_pdo_sqlite.so into the dynamic extensions section of your php.ini. The default web root is /var/www/nanoweb, so you can unpack a MediaWiki codebase into there and go through the install procedure from http://localhost. It often locks up when saving an article, restarting it shows that the save had worked though.